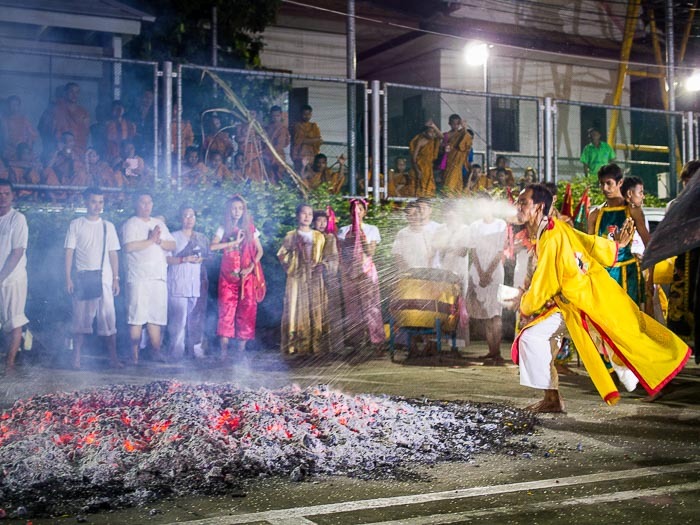 A man runs through the fire pit during the firewalking at Wat Yannawa Wednesday night. 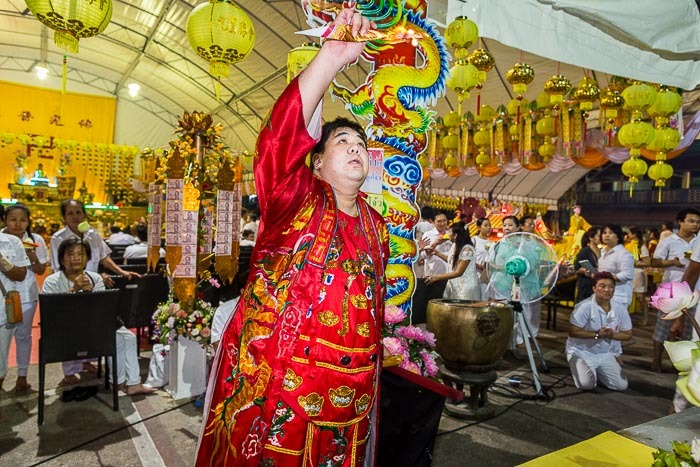 The Vegetarian Festival is drawing to a close with more extreme displays of piety. I went to Wat Yannawa on the Bangkok Chao Phraya River waterfront because I read that there would be a Vegetarian Festival ceremony there. I didn't have much information on the ceremony, and I wasn't sure what I was getting into. Wat Yannawa is a little bit off the normal tourists' trail. It's south of the Saphan Taksin BTS station (you can see the temple from the station) but most people go north on the river towards old Bangkok and bypass the temple, which is fine with me. Last night I was the only foreigner at the firewalking. 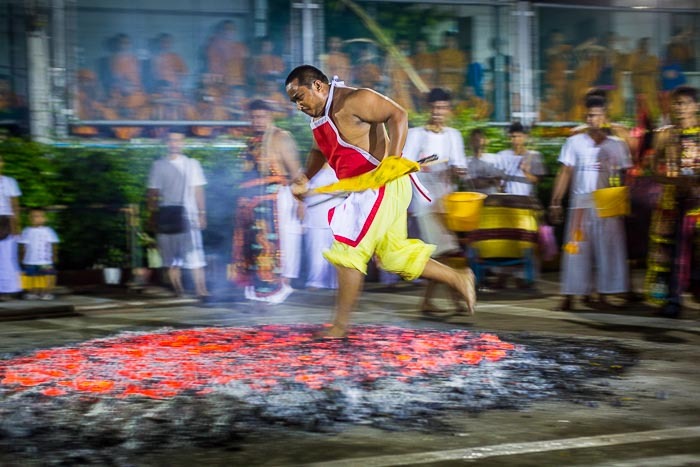 Firewalking is common at Vegetarian Festival events in Phuket, where the Vegetarian Festival is celebrated with a lot of energy, and packed with foreign tourists and photographers. It's relatively rare in Bangkok though. Wat Yannawa is a part of Bangkok's history. The Chao Phraya River used to be Thailand's gateway to the world. The tall ships and 19th century steamers dropped anchor and unloaded their freight at piers along the river. Foreign embassies were along the riverfront. Chinese junks used to drop anchor at a pier at what is now Wat Yannawa. Tens of thousands of Chinese immigrants coming to Thailand made landfall at that pier. In some ways, it's Thailand's "Ellis Island." 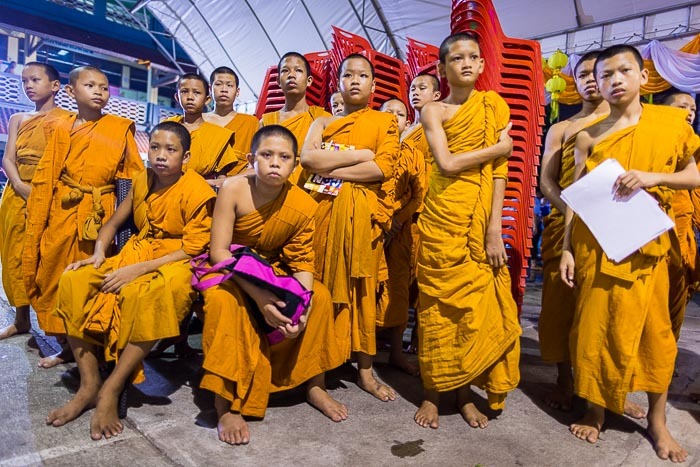 Buddhist novices watch the Vegetarian Festival ceremony. There is a monastery at the temple, hundreds of novices are students there. A firewalker leads a blessing ceremony before walking across the glowing coals. Now the port is down river, at Khlong Toei (and Sattahip, the larger port is in Chonburi province is now Thailand's main deep water port). Wat Yannawa is a Theravada temple (most Chinese temples at Mahayana Buddhist) but the connection to its Chinese past is strong. The temple's wiharn (prayer hall) is built in the shape of a Chinese junk to keep the connection to the old days fresh. 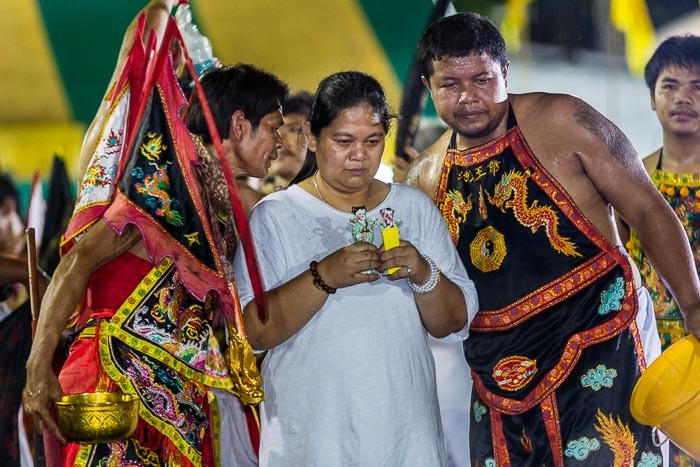 Another part of that connection is that it hosts one of Bangkok's most energetic celebrations of the Vegetarian Festival. A man blows alcohol onto the fire to keep the embers going. Running across the fire pit. I got to the temple about 1.30PM because I wasn't sure when things were going to start. There was a food distribution for poor members of the community at 2PM (this is a traditional way of celebrating Chinese holidays) and prayers throughout the afternoon. I didn't make too many pictures but I decided to wait it out because people were setting up for firewalking and firewalking was what I came hoping to see. Prayers broke up about 4.15 and people moved to a huge tent for a vegetarian banquet. I was getting ready to walk out to a nearby food stand when a young couple grabbed me and brought me to their table to eat with them. Thus commenced a three hour, eight course feast of Thai Chinese vegetarian food. I don't speak Thai and my hosts didn't speak much English but we got along great. I know enough Thai to understand food and they spoke enough English to tell me what I was eating. There were oysters, except since this is the Vegetarian Festival they were mushrooms prepared as oysters. There was duck, except since this is the Vegetarian Festival it was tofu prepared as duck. 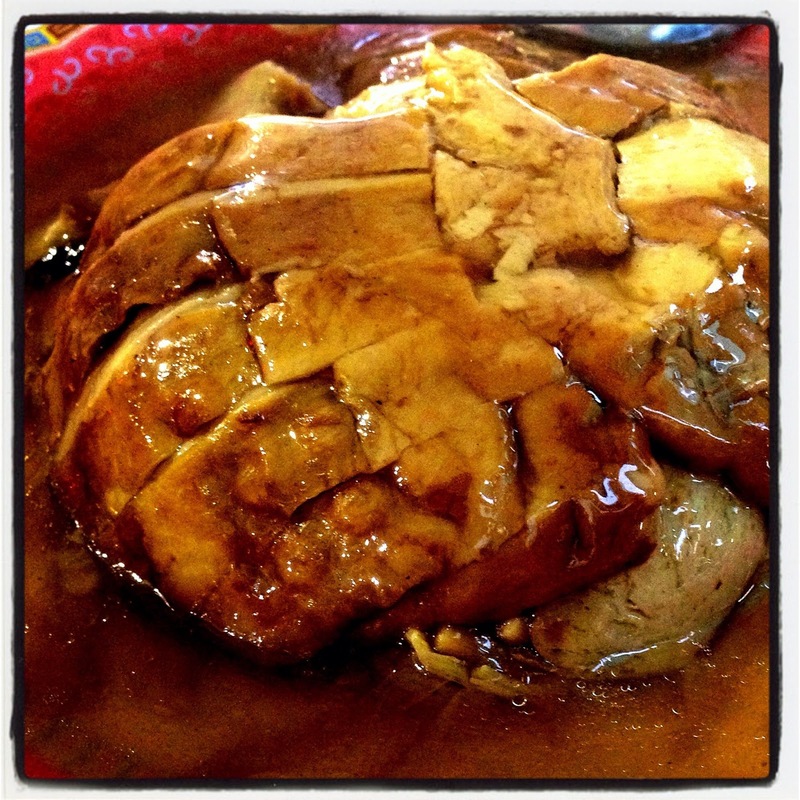 There was stewed pork, except since this is the Vegetarian Festival it was tofu prepared as pork. There were noodles with pork and chicken, except since this is the Vegetarian Festival it was tofu prepared as pork and chicken. You get the idea. The food just kept coming. All of it was excellent. The duck tasted sort of duck-ish, the pork not so pork-ish but it was all tasty. 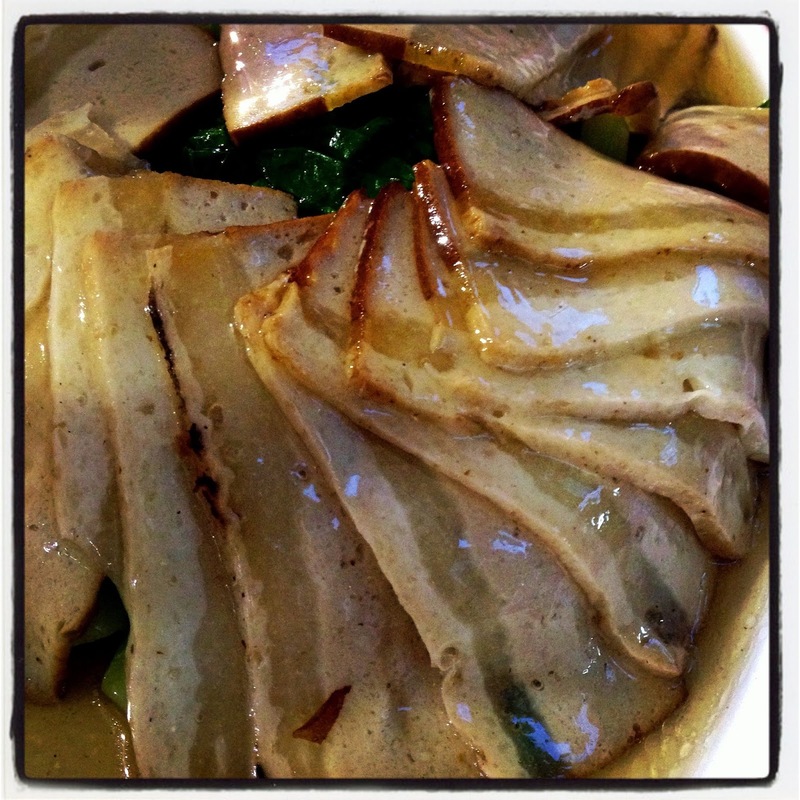 An iPhone photo of stewed duck (tofu prepared as duck). 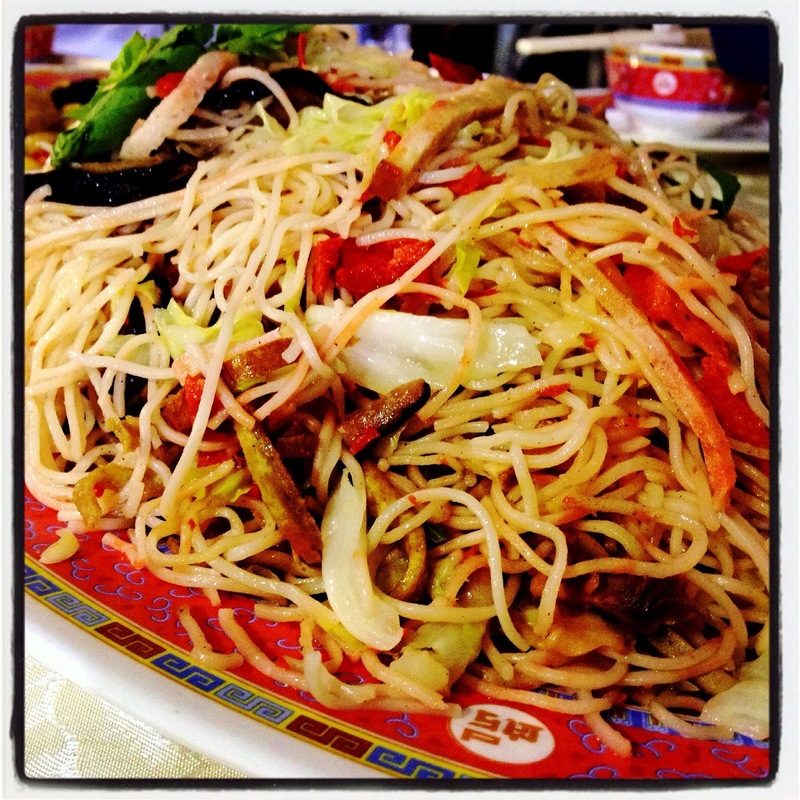 Noodles with tofu prepared as pork and chicken. There was an auction going on throughout the meal. My hosts spoke just enough English to tell me keep my hands down unless I wanted to buy a food processor (or a rice cooker or a statue). After dinner there was another prayer service and a procession which led adherents over small fire pots. A firewalker goes into a trance like state before racing across the coals. Then the main event started, about 30 minutes of men and women racing across the coals. I don't know how they do it. The fire was well tended and hot, I couldn't stay near the edge of the pit for more than a few minutes before I had to step back. Most of the firewalkers (although truthfully, fire running would be more accurate) went through the pit several times. 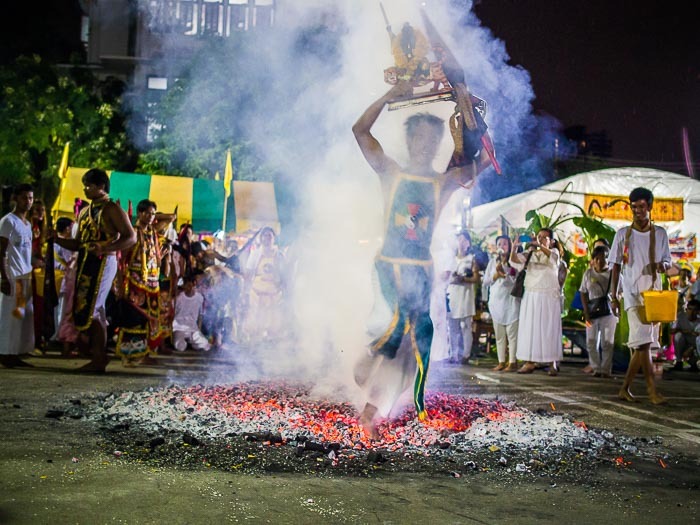 At first only experienced firewalkers crossed the embers but as the evening went on people from the crowd came out and ran across the coals, many carrying religious statues. Experienced firewalkers encourage a first timer. A firewalker comes out of the smoke holding a statue over his head. 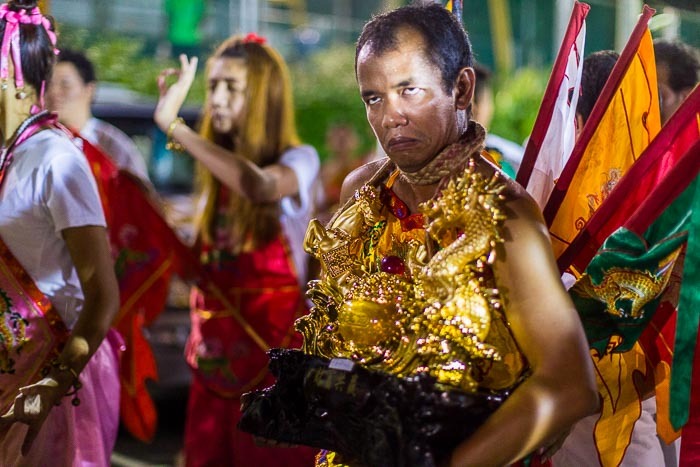 I went down to Wat Yannawa expecting to spend a couple of hours photographing Vegetarian Festival rituals and ended up spending more than eight hours photographing one of the most intense experiences I've seen in Thailand. To be fair though, three of those hours were a blur of tofu and vegetables. It was a great evening. 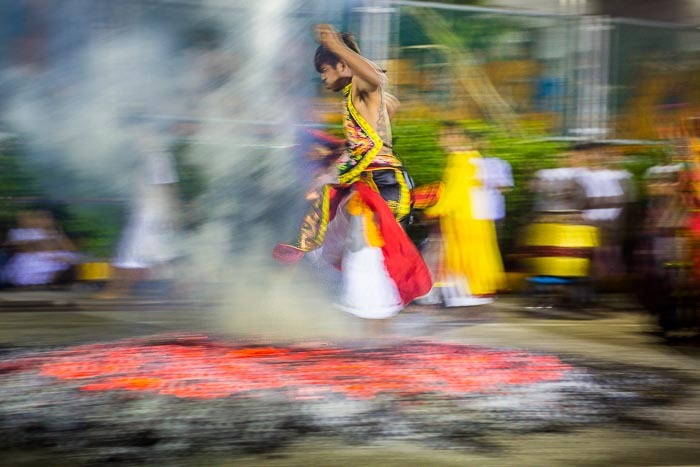 There are more photos of firewalking in my archive or available from ZUMA Press.